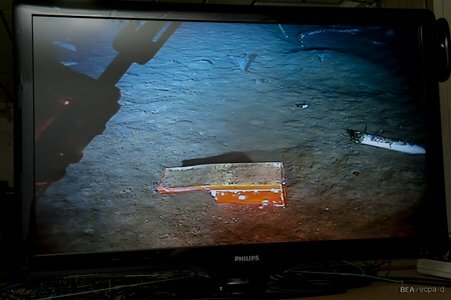 During the underwater search for the wreckage of Air France Flight 447 which crashed in the Atlantic Ocean in June 2o09, an ROV found the chassis of the airplane’s Flight Data Recorder (FDR). The chassis didn not contain the Crash Survivable Memory Unit (CSMU) that contains the data. It was surrounded by debris from other parts of the airplane.